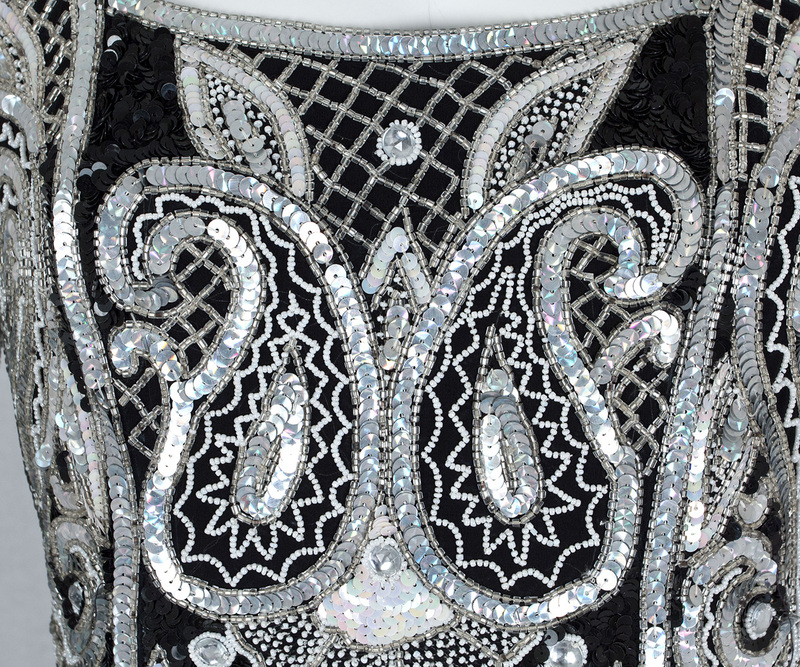 Naeem Khan's best gowns call on his unmatched expertise in fine embroidery. 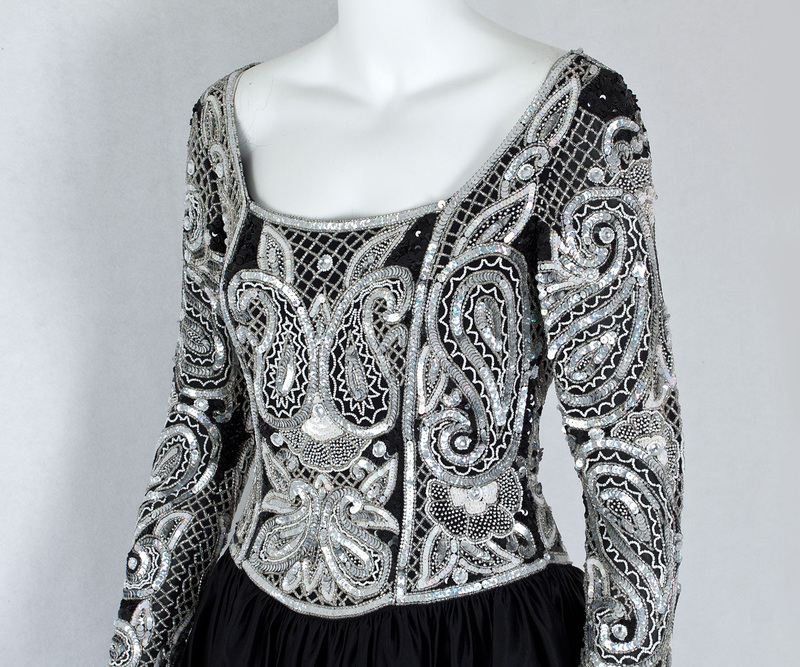 The effect is dazzling in the brilliant bodice design, which combines sparkling iridescent white sequins with black sequins and white beads. When viewed in person the design is vibrant and unforgettable; unfortunately the photographs did not capture the sparkle. The up and coming designer Naeem Khan has already established a loyal celebrity following—Jennifer Lopez, Eva Longoria, Beyoncé, and Queen Noor of Jordan. 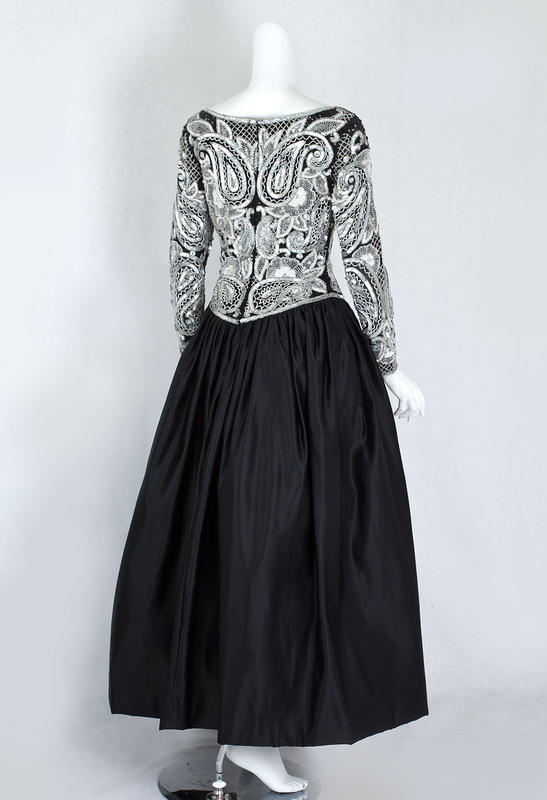 This exquisite evening dress was owned by a collector who appreciates both vintage fashion and exciting new talent. 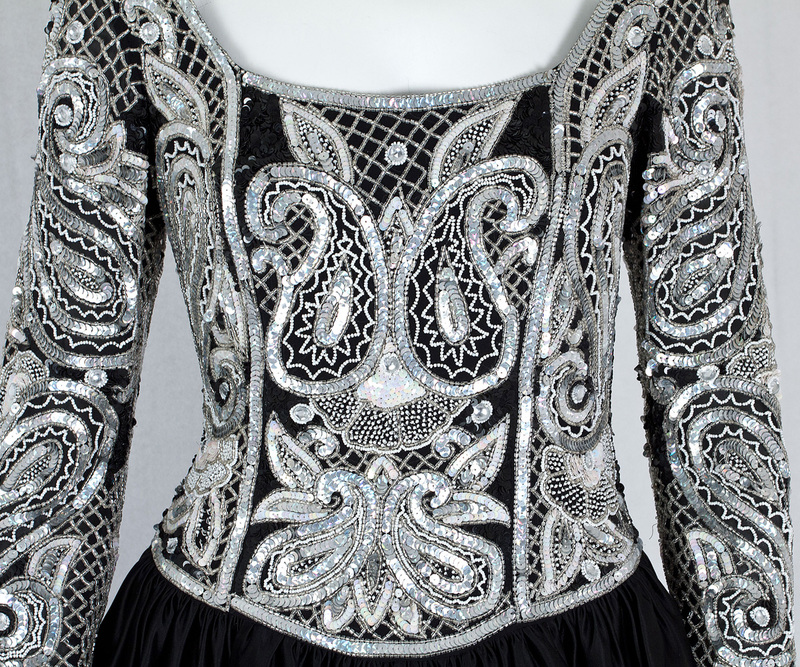 Khan's intricately detailed aesthetic was developed at an early age in his family's embroidery business. His apprenticeship with Halston in the 1970s taught him the value of line and cut. 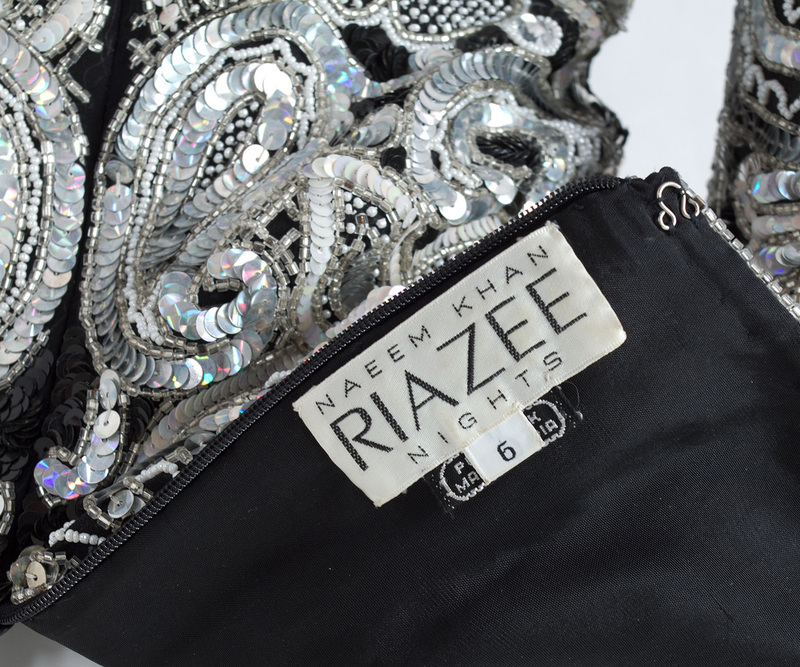 When he launched his first design company Riazee in 1983, it was an immediate success. 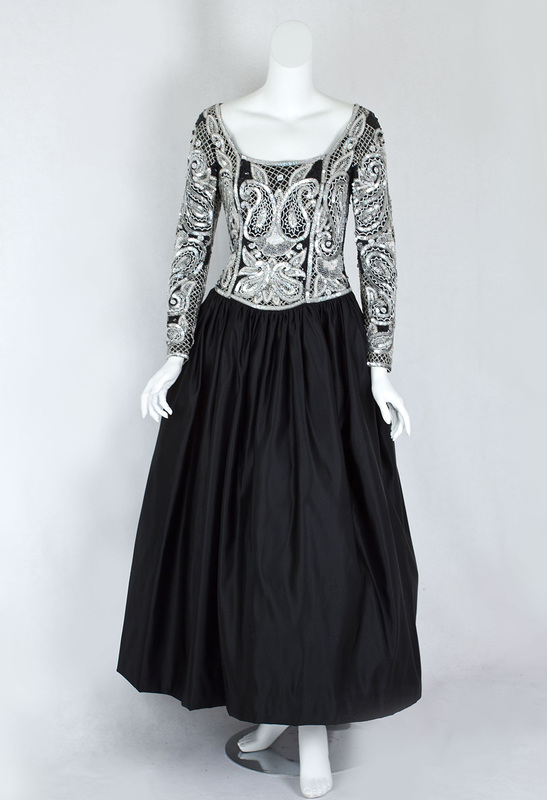 The stylish gown pairs an elaborately hand-embroidered bodice with an elegant black skirt. 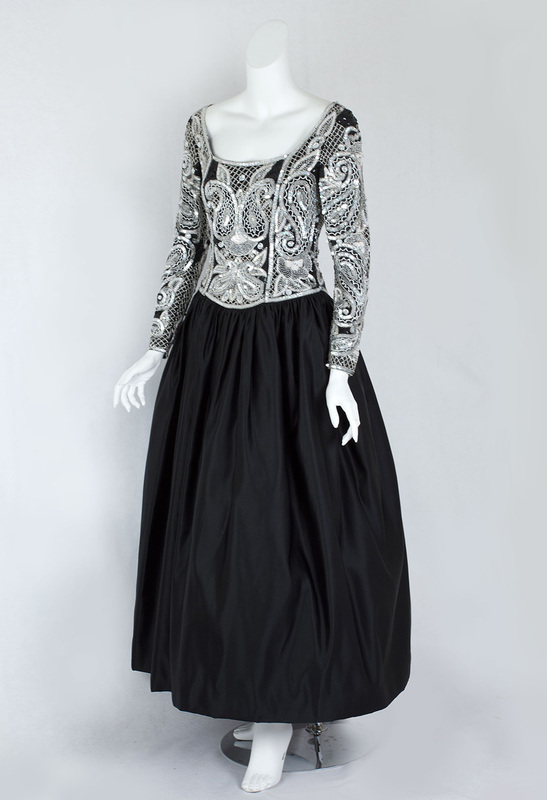 The bodice is lined with black silk. Khan artfully incorporates the ancient boteh motif into the intricate design. The boteh, or paisley motif, represents the growing shoot of the date palm, considered the tree of life. Made from substantial-weight black silk satin, the skirt has a built-in crinoline to hold the shape. The glamorous gown closes in back with an invisible zipper. 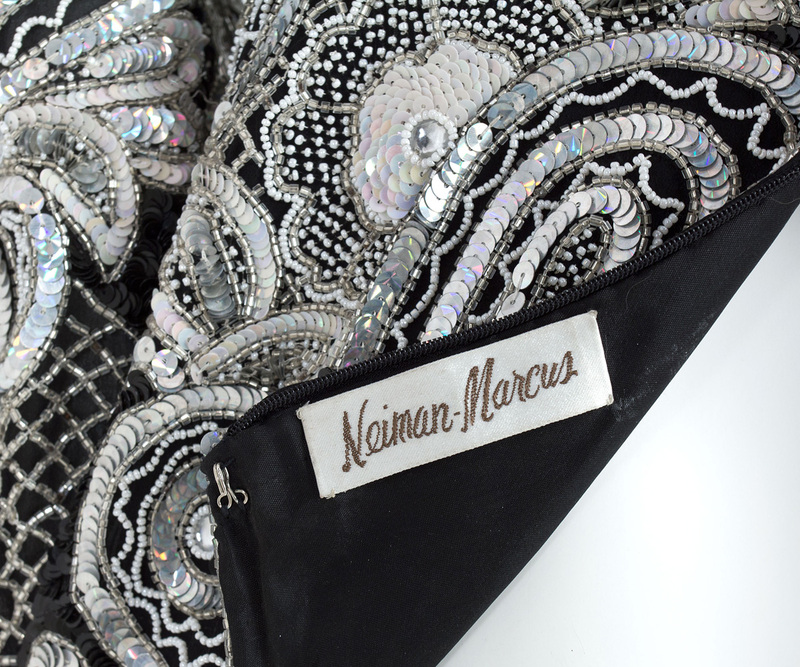 There are two labels: Naeem Khan and Neiman-Marcus. The Persian-style design evokes exotic places where one could luxuriate in pleasure: Port Said, Shanghai, Turkestan, Constantinople—lands of sad haunting music, where lust could be a mode of life. There the sunsets and the shades of night skies reflected moods of passion, which had the color of lips and of poppies. The condition is excellent. The dress looks like it was never worn. What an amazing buy: if bought new today, it would go for north of $2000. It still has the original attached envelope of replacement beads. It measures: 36" bust, 28" waist, full over hip, 23 1/2" sleeve length, and 57" from shoulder to hem.